Located on the east edge of the village, Indian Creek is named for Little John, a Chippewa who lived on the creek with his family. In the year 1806, Little John was killed while chopping down a tree — game he was pursuing had gone into the tree and Little John was determined to bag the prey. But the tree fell on him, and when members of his society discovered his lifeless body, they ran to the house of Major Morse, who lived in Harpersfield. The Indians had painted themselves in black, a sign of mourning, and motioned for Morse to follow them to the site of Little John’s accident. The European settlers realized that the Indians wanted Little John to be honored with burial, and they assisted in burying him near the creek where he and his family had their wigwam. Little John was buried in a sitting position with his earthly possessions: a knife, hatchet, kettle and rifle. A post, painted red, marked his grave on the west side of the bank. Thieves, aware of the possessions that had been buried with Little John, entered the grave and removed the items. Eventually, they even removed Little John’s bones. This desecration led to ghost stories. Great stands of poplar and other woods used in ship building stood in Geneva Township in the early 1800s. A sawmill was constructed on Indian Creek by George Turner; the mill could handle logs up to 60 feet in length. Although a shallow stream today, Indian Creek was the site of several boat construction projects and launches, the latter usually being mired in difficulty. The first boat to be built here was the Geneva, built in 1838. The sloop was owned by Col. George Turner and Thomas Makepeace Fitch. The vessel was to be used in the stone trade on Lake Erie. To provide sufficient draft to launch the sloop, floodgates on the mill dam upstream were opened. While providing the additional depth needed, when the vessel reached the bridge across the creek, it would not clear the deck. Martin Watrous of Ashtabula purchased the sloop and ran it in the limestone trade between Ashtabula and the western islands. 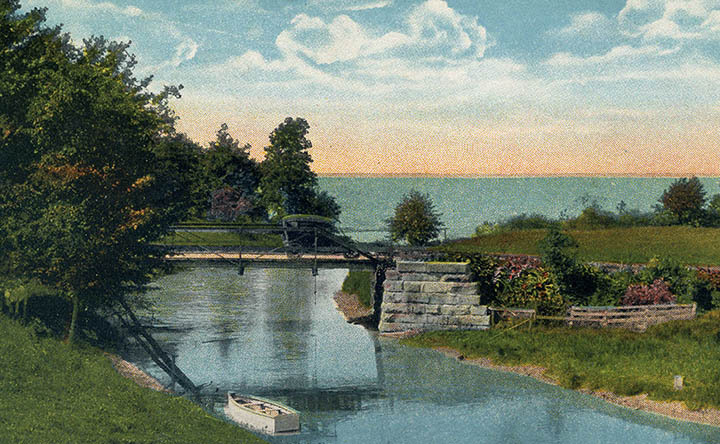 While entering Ashtabula Harbor with a load of block stone, the Geneva struck a pier and sank. A young sailor from Conneaut was killed in the incident. The wreck was uncovered in 1903 when the Pennsylvania Railroad was dredging for a dock expansion. The Geneva was “well preserved” and the wreck slowed progress on the dredging project. Next came the Philena Mills. Turner hired James Lockwood of Geneva to build this ship; James Mills and Eliakim Roberts were the investors. They built the ship from 1846 to 1847 using oak harvested from Saybrook Township. No local lumber was deemed suitable for its masts, so the lumber for that was brought from Sorrel Hill, Pa., about 40 miles away, using oxen. Philena Mills was 100 feet long, rated at 270 tons and was considered one of the finest sailing ships of its time on the Great Lakes. After one season of operating the ship, the investors sold it. It lasted about 20 years before being wrecked near Madison. The G.L. Roberts launched in 1848 on Indian Creek. George Turner had a 48 percent interest in the boat, which was built with lumber from Saybrook. This time, the mast pine came from the swamps of Saybrook,. His son, MatthewTurner designed the ship specifically for the lumber trade. At the end of the 1848 shipping season, the young Matthew Turner married Amanda Jackson. But she soon contracted a fever and died. The despondent Turner returned to sailing on the G.R. Roberts and came up missing at the end of the season. His father placed ads in the papers along the Great Lakes seeking information about his son. A $500 reward was offered. Matthew eventually returned home, in his own timing, unaware of the concern he’d caused his family. Sometime thereafter, Matthew Turner contracted “Gold Fever” and headed to the West Coast, where he made a small fortune and used his earnings torchase the schooner Toronto, which he sailed from New York to California. The Gold Rush had created a huge demand for lumber, and Turner built an industry of hauling lumber from northern California to San Francisco. Turner began building larger ships for his business and opened up trading with Tahiti. That led to cod trade and he opened up the Pacific cod industry. While on one of his voyages, he and his crew helped save the lives of British sailors. At Hunter’s Point, Calif., Matthew Turner and his brother Horatio Nelson, set up shipyards that grew into the Matthew Turner Shipyards. He built there another Geneva, which made the passage between Tasmania and New South Wales in two days. These shipyards operated until 1918. The Vampire was the last ship built on Indian Creek. Built by Capt. Perry White of Ashtabula, it was built/launched in the summer of 1867. The largest ship ever built on Indian Creek, The Vampire drew a great deal of attention. A large celebration was planned for its launch, but the celebration turned to embarrassment and frustration when The Vampire slid into the creek and hit bottom; it was too heavy to float. Many hours of hard labor were required to free the ship and finally get it onto Lake Erie. It was the last vessel built on Indian Creek. 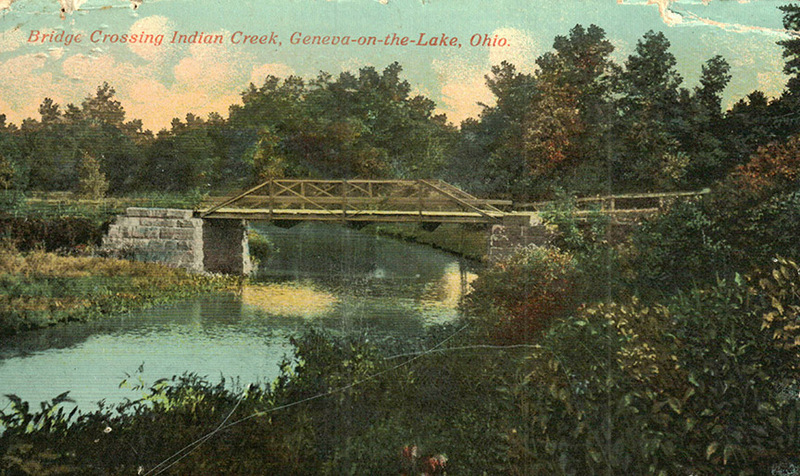 In the early 1900s Indian Creek was eyed as the route for the canal that would connect Lake Erie to the Ohio River. Of course, this canal was never built, but had it been, Geneva-on-the-lake probably would have become an industrial town, with a large steel mill on Wheeler Creek planned.